This crochet kit includes the Fall issue of Interweave Crochet and enough yarn to crochet the Aspen Infinity Cowl in Tobacco Gold, as seen in the magazine. Exclusive to the Crochet Me Shop, order your Crochet Aspen Infinity Cowl Kit in Tobacco Gold for the entire print edition of Interweave Crochet Fall 2013 magazine PLUS enough gorgeous handpainted yarn to crochet the fast and fabulous Aspen Infinity Cowl featured in the magazine. Hurry! 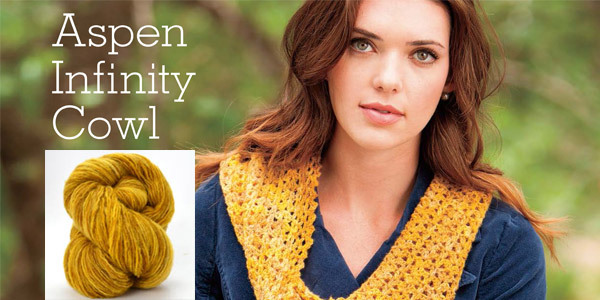 We have a limited supply of Crochet Aspen Infinity Cowl Kits. Order today for the best selection. Get hooked this fall with 19 instant crochet favorites. 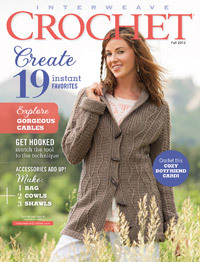 Crochet a boyfriend cardigan to wear all season, explore crocheted cable techniques, and learn tips and tricks for picking the best crochet hook for your project, your yarn, and your crochet technique. Plus, dive into fall accessories with cozy cute crocheted cowls, elegant shawls, and even a must-have crocheted bag. You can't ever have too many accessories! The Fall issue of Interweave Crochet features the Aspen Infinity Cowl, a fast and fabulous crochet project perfect designed by Linda Permann for an updated fall wardrobe. Or, make this quick-to-crochet cowl as a gift for the upcoming holidays. A luxurious blend of finely-milled fibers from Italy, one strand of Merino Wool and a second strand of blended cashmere/silk/merino, are gently twisted to create a softly-brushed, cashmere-feel yarn. Each 400 yard skein of Tranquility is handpainted by fiber artist Iris Schreier. Note: colors may vary slightly from what is seen here. Hurry! We have a limited supply of this special crochet Kit. Order today for the best selection. 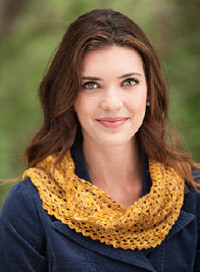 Order your Crochet Aspen Infinity Cowl Kit in Tobacco Gold! 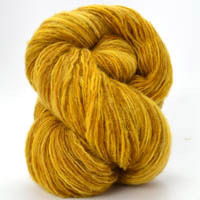 The yarn is very soft and easy to work with. The pattern is simple, and the cowl looks great due to the subtle shadings in the yarn. I bought 3 kits of the 2 colorways offered and immediately made one of these cowls the night the order came in.